LOS ANGELES (AP) — "Can You Ever Forgive Me?" is a film about Lee Israel, a biographer who started a side hustle writing fake letters as Noel Coward, Louise Brooks, Dorothy Parker and other deceased luminaries and selling them to collectors. Part cautionary tale, part celebration of this unapologetic literary rebel who was so good that her forgeries even appeared in a Coward biography, it's also the year's unlikeliest mediation on friendship between two people who've been tossed out by polite society. In a story Aug. 22 about (topic), The Associated Press reported erroneously that PBS filed a lawsuit regarding "The Happytime Murders." It was Sesame Workshop, which makes "Sesame Street." Aug. 26: Singer Vic Dana is 78. Singer Valerie Simpson of Ashford and Simpson is 73. Singer Bob Cowsill of The Cowsills is 69. Bandleader Branford Marsalis is 58. Guitarist Jimmy Olander of Diamond Rio is 57. Singer Shirley Manson of Garbage is 52. Guitarist Dan Vickrey of Counting Crows is 52. Drummer Adrian Young of No Doubt is 49. Actress Melissa McCarthy is 48. Actress Meredith Eaton (2017's "MacGyver," ''Family Law") is 44. Actor Mike Colter ("Jessica Jones") is 42. Actor Macaulay Culkin is 38. Actor Chris Pine is 38. Singer Brian Kelley of Florida Georgia Line is 33. Singer-actress Cassie is 32. Actor Evan Ross ("The Hunger Games: Mockingjay") is 30. Actress Danielle Savre ("Station 19," ''Heroes") is 30. Actor Dylan O'Brien (TV's "Teen Wolf") is 27. Actress Keke Palmer ("Akeelah and the Bee") is 25. NEW YORK (AP) — The makers of "Sesame Street" are suing the promoter of a new Melissa McCarthy movie, saying it's abusing the famed puppets' sterling reputation to advertise the R-rated film. LOS ANGELES (AP) — "Avengers: Infinity War" topped the charts for the third weekend in a row, adding $62.1 million to its domestic grosses. The superhero blockbuster has now earned $548.1 million from North American theaters. It easily beat out newcomers, such as the Melissa McCarthy comedy "Life of the Party," which opened in second place with $17.9 million, and the Gabrielle Union thriller "Breaking In," which took third with $17.6 million. LOS ANGELES (AP) — "Avengers: Infinity War" is still ruling the box office in its third weekend in theaters, easily beating out the mom-themed fare. OPELIKA, Ala. (AP) — Hollywood rolled out the red carpet in Opelika as college students and residents had the chance to see the premiere of Melissa McCarthy's new film. Local media report that Auburn University was awarded the world premiere of "Life of the Party." Students showed their school spirit to land the premiere, which took place on Monday at a theater in Opelika. The movie is set to open in all theaters on May 11. 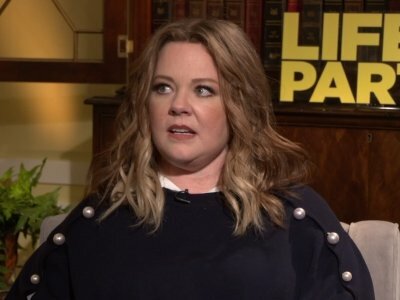 LOS ANGELES (AP) — Melissa McCarthy hasn't had a movie in theaters since "Ghostbusters" two years ago, but it's not like she's been taking a break. Melissa McCarthy thinks she'd have gone "cuckoo" if she'd found success earlier. The 47-year-old actress got her big break in TV show 'Gilmore Girls' in 2000 and she will always be grateful for the years she had to "struggle" because it's made her more appreciative of what she has. “Ready Player One,” Steven Spielberg’s pop-culture flashback disguised as a futuristic virtual reality adventure, is going to lock up all — well, most of — the screens starting Thursday. But it’s just the beginning of a fun and varied spring movie season. Las Vegas — South Korea automaker Kia rolled the dice at the CES technology show Monday with a big play for a self-driving, electrified future. As part of its "ACE" strategy — autonomous, connected and eco/electric — Kia announced plans to test an autonomous vehicle fleet by 2019, introduce 16 new, battery-powered vehicles by 2025, and make all its models "connected cars" by 2030. LOS ANGELES (AP) — Dave Chappelle and Melissa McCarthy are Emmy winners, earning trophies for their appearances on "Saturday Night Live." NEW YORK (AP) — Things may look bleak for Democrats these days, but Michael Moore thinks he knows how they can get back on top. "Humor is the non-violent weapon by which we're going to help turn this around," said the Academy Award-winning director of "Bowling for Columbine" who is currently starring in his one-man Broadway show. "If you use your sense of humor and your wit to go against what's going on, it can be devastating and it can reach a lot of people." WASHINGTON (AP) — From Day One, it was clear that Sean Spicer was in for a rocky ride as President Donald Trump's press secretary. His defense of Trump's false claims about the size of the crowds at the inauguration. The talk of Spicer huddling in — or among — the bushes. Spicer's reference to a Nazi gas chamber as a "Holocaust center." The indignities were many, some tied to Trump's behavior and demand for loyalty, some to Spicer's own missteps. For six years, Billy Gardell answered to “Mike,” as in Officer Mike Biggs, the character he played on the CBS sitcom “Mike & Molly” alongside Melissa McCarthy as Molly. Earlier this year, Gardell went by Colonel, starring in the CMT miniseries “Sun Records” as Colonel Tom Parker, Elvis Presley’s manager. But before he was the Colonel, and before he was Mike, the actor was Billy Gardell, stand-up comedian. Get ready to know the name Tiffany Haddish. If there were such a thing as Comedy Oscars, she would win for "Girls Trip ." 'Saturday Night Live' and 'Westworld' lead the Emmy nominations with an impressive 22 nods. The 42-year-old comedy sketch show is in the running for a host of honors at this year's ceremony, including Best Supporting Actor in a Comedy for Alec Baldwin, thanks to his portrayal of President Donald Trump, while Melissa McCarthy - who generated headlines for her impersonation of White House press secretary Sean Spicer - is up for Guest Actress in a Comedy. Melissa McCarthy is set to star in 'Margie Claus'. The 46-year-old actress has been tapped to play a role in the Christmas-themed movie after New Line Cinema purchased the pitch from McCarthy, her husband Ben Falcone and their co-writer Damon Jones. Dan Aykroyd is criticizing the director of last year's "Ghostbusters" remake for spending too much money to make the film. The "Ghostbusters" reboot starred Kristen Wiig and Melissa McCarthy and was helmed by "Bridesmaids" director Paul Feig. NEW YORK (AP) — NBC's comedy institution "Saturday Night Live" reached its largest audience since 2011 with last weekend's episode hosted by President Trump impersonator Alec Baldwin and featuring the return of Melissa McCarthy portraying White House press secretary Sean Spicer. NEW YORK (AP) — After saying she'd like to play President Donald Trump's controversial adviser Steve Bannon on "Saturday Night Live," comedienne Rosie O'Donnell has apparently changed her Twitter profile picture to make herself look like him. O'Donnell's offer to play the chief strategist came after actress Melissa McCarthy's caustic portrayal of White House Press Secretary Sean Spicer on "SNL" last weekend. NEW YORK (AP) — On the heels of actress Melissa McCarthy's caustic portrayal of White House Press Secretary Sean Spicer on "Saturday Night Live," comedienne Rosie O'Donnell says she's available to play President Donald Trump's controversial adviser Steve Bannon. On her Twitter feed Monday night, O'Donnell responded to suggestions that she play Bannon by saying "available — if called I will serve." Adam Ray is addicted to performing. He’s 34 and has bundles of energy, which is why he’s a master juggler of sorts, working on numerous aspects of his career all at the same time. Ray-the-stand-up-comic is coming to Comix at Mohegan Sun for four shows Thursday through Saturday, Jan. 20-22. He is also a very successful voice-over artist, writes and produces original sketches for his website and is an actor in television and film roles. U.S. box office gross: $128,344,000Smart Rating: 76.32U.S. release date: 07/15/2016Starring: Melissa McCarthy, Kristen Wiig, Leslie JonesArmed with proton packs and plenty of attitude, four women (Melissa McCarthy, Kristen Wiig, Leslie Jones, Kate McKinnon) prepare for an epic battle as mischievous ghosts start to wreak havoc in New York. The modern studio comedy increasingly feels limp, suffocated by the financial imperatives of high-concept plots and desperately in search of signs of life. Greg Mottola's "Keeping Up With the Joneses" is, like many before it, fine enough. But it mostly goes down as another collection of funny people stuck in too narrowly clichéd roles in an overly familiar story. On her new album of duets, Barbra Streisand is asked by one of her guest singers one of those ridiculous, starry-eyed questions that only someone who lives in an oceanfront estate in Malibu would consider. NEW YORK (AP) — Dwayne Johnson elbowed Robert Downey Jr. aside to become the highest-paid actor with a fast and furious income of $64.5 million, according to Forbes magazine. The former wrestler beat out Jackie Chan with $61 million and Matt Damon, who earned $55 million. The rest of the top five on the list, released Thursday, included Tom Cruise with $53 million and Johnny Depp with $48 million. NEW YORK (AP) — "Ghostbusters" star and "Saturday Night Live" cast member Leslie Jones is bringing her enthusiasm for the Olympic games to Rio itself. A tweet from Sony Pictures' "Ghostbusters" account that many interpreted as an endorsement of Hillary Clinton has disappeared as quickly as a phantom. The studio tweeted "Boo-yah, we smashed your glass ceiling," on Thursday after Clinton became the first woman to lead a major U.S. political party. The message also had the hashtag "ImWithHer," a Clinton campaign motto. BEVERLY HILLS, Calif. (AP) — Melissa McCarthy answered the call for Netflix's "Gilmore Girls" sequel and made magic again with star Lauren Graham, the show's creator said. McCarthy's career has soared with movies including "Bridesmaids" and "Ghostbusters" since she played Sookie in the 2000-07 series, complicating efforts to fit taping into her busy schedule, said Amy Sherman-Palladino. But it was inevitable, she added.